What do non-pescription glasses give you and how do I choose them? Around 50% children in middle school have problems with their eyesight. Almost every third child in the first class of primary school in the Silesian Voivodeship has a damaged vision. However, some young people with healthy eyesight opt for fashionable non-correction glasses. Non-prescription glasses – do they harm? Jak często powinniśmy badać wzrok? To jedno z najczęściej zadawanych pytań dotyczących naszego wzroku. Zapoznaj się z naszą rekomendacją dotyczącą częstotliwości badania wzroku u optometrysty. Limited edition Ray-Ban® Scuderia Ferrari in Optique! A dynamic collection for those who are not afraid to dictate the tempo. The Ray-Ban Scuderia Ferrari collection has easily recognizable accents and combines a passion for tradition and innovation. We present a film about new models that were created in cooperation with Ray-Ban and Ferrari brands. How to choose glasses for driving a car? Monday - Friday 10:00 a.m. - 06:00 p.m. Choose a trusted optician! We offer the highest quality RAY-BAN® glasses and the most fashionable Oakley glasses at affordable prices. 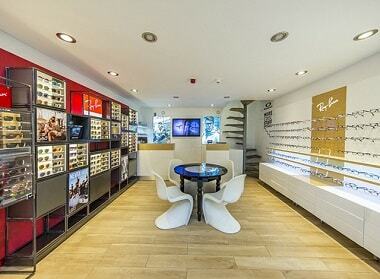 Optique Boutique is a well-known and cult place, it is more than just an optician. It's a lifestyle. Join our creative community. From now on, nothing will be the same. From now on, the sweet taste will be even more pleasantly sweet and the colours will take on more vivid colours. Imagination will take over your thoughts and develop your wings for flight. Do you like this vivion? Feel welocme to visit us! Every day we serve a new portion of positive emotions and professional service. 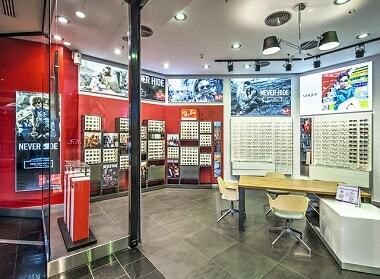 We'll help you choose lenses from Essilor, RAY-BAN® glasses or extremely lightweight and face-fitting Oakley glasses. Where is it best to buy RAY-BAN® prescription glasses if not in a boutique awarded with the prestigious RAY-BAN® Certified Premium Reseller? Welcome to the world of RAY-BAN® glasses, one of the most recognizable brands in the world, whose mission is to change the way you think about glasses - RAY-BAN® glasses are designed not to hide behind them, but to stand out from the crowd. Aesthetic considerations and fashionable design are not the only reason why so many people decide to trust the RAY-BAN® brand - glasses with their logo are above all the best materials, ensuring durability and safety of eyesight. It's worth putting on RAY-BAN® - glasses like these can't be found anywhere else. For those who appreciate the highest quality optical products, we offer Oakley glasses, considered to be one of the most cult on the market. The Oakley glasses, which come out of the Oakley brand name, stand out above all due to their perfectly matched frames and attractive, timeless design, and at the same time they have excellent technical parameters. The popularity of Oakley glasses stems from more than 40 years of brand experience and the fact that the company founder was a professional athlete who best understood the requirements of very active people for the equipment they use. You can use Oakley glasses for both sports and standard sun protection. Oakley also has a special line for women, children and prescription glasses. Qualified optician, eyepiece stylist - Eyefitter, free eye test, Varilux progressive glasses and Authorized RAY-BAN® Official Service, glasses.CWe look forward to seeing you at the Optique on Plac Trzech Krzyży 18, Optique Galeria Mokotów and Optique Arkadia and at www. optique. pl. We have frames for adults and children. Both artists and business people dress with us. Are you looking for fashionable glasses that will make you stand out from the crowd and show your personality? Discover the latest collection of RAY-BAN® glasses, check out the Oakley brand, eyepieces like these don't buy at random. 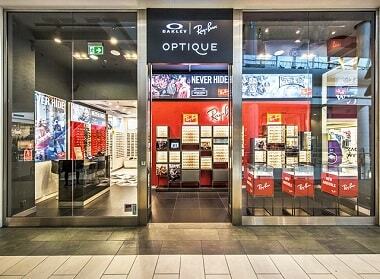 The RAY-BAN® shop is the largest selection of optical products! Eyewear is becoming more and more important in every style - if you are looking for something to complement your classic or extravagant look, we invite you to our boutique, where Eyefitter and hundreds of interesting frames are waiting for you. How to order prescription lenses via Internet?